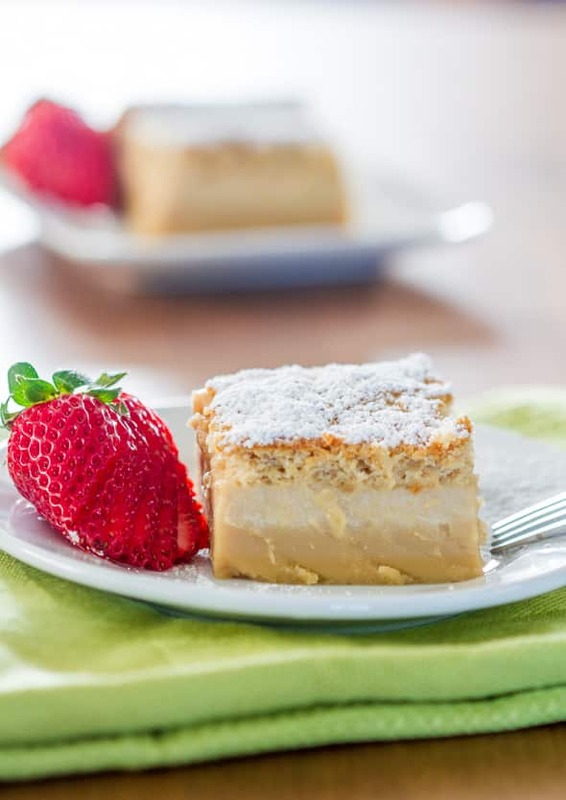 Butterscotch Magic Cake – one very thin simple batter amazingly turns into a 3 layer cake as it bakes. It’s magical! I love long weekends. In Canada we celebrated Family Day and in the States President’s day. Pretty much all weekend I did nothing but putz around the house, and watched Once Upon a Time on Netflix. I’m obsessed with this show now. If you get Netflix watch it, it’s awesome. 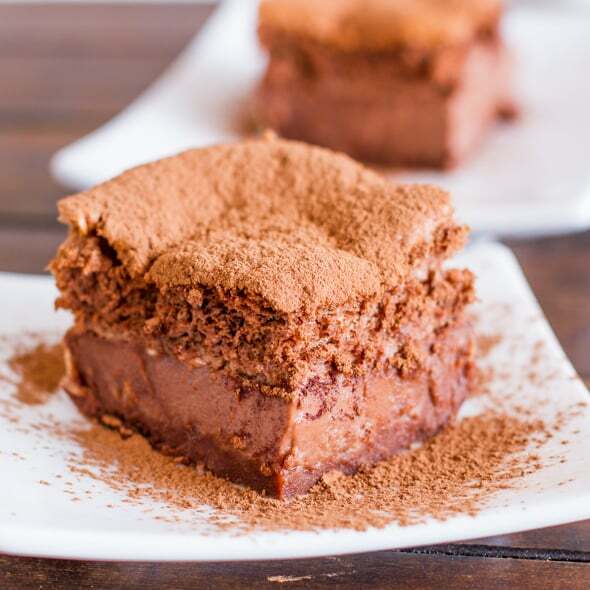 Besides watching Netflix I’ve been answering a lot of questions on making Magic Cake and Chocolate Magic Cake from you my dear and loyal readers. Since I didn’t have step by step pictures with the other two recipes, I thought it was time for another delicious magic cake recipe, and decided upon butterscotch magic cake. I love butterscotch flavor so you can’t go wrong with this flavor. Hopefully I will also answer a lot of your questions here. There really is no magic to this cake. The only magic is the simplicity of taking one batter and turning it into a 3 layer cake as it bakes. 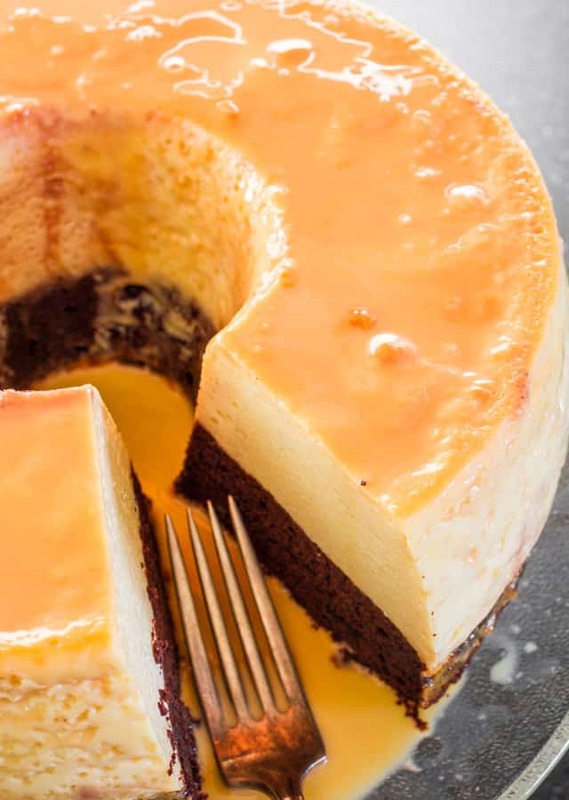 As you can see in the picture above you can literally see 3 distinct layers, the bottom layer which is the thicker layer, the middle layer which is the custard layer, and the top layer which is the cake layer. 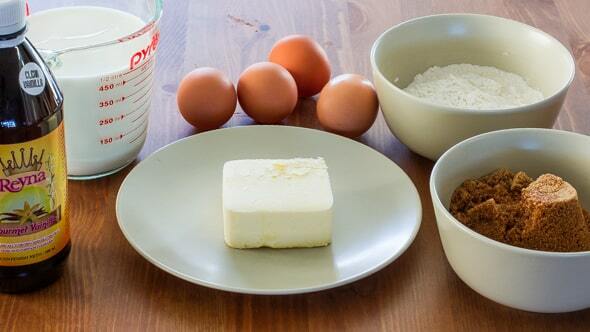 First of all here are all the simple ingredients you need for this cake. 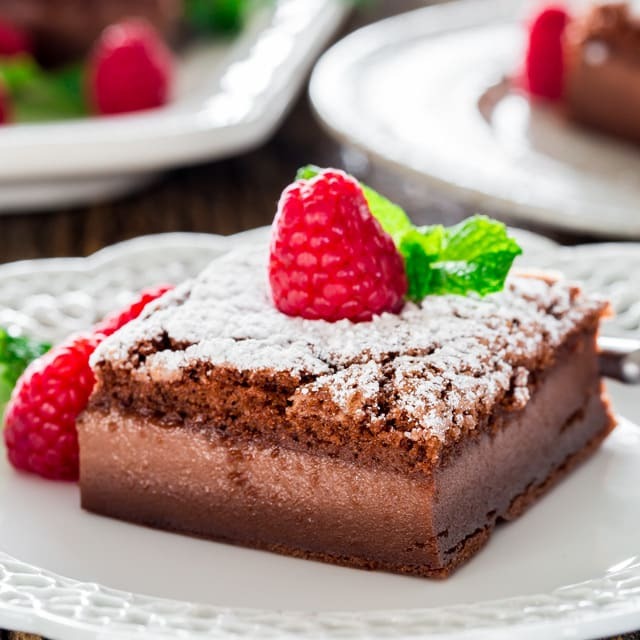 This is the other great thing about this cake, the ingredients, they’re probably ingredients you already have in your pantry. I want you to pay attention of how little flour is needed in this cake compared to the milk, only 3/4 cup of flour to 2 cups of milk. This is no mistake, this is how it’s supposed to be. The original recipe calls for 125 g of white sugar which turns out to be 3/4 of a cup, however brown sugar, since it’s more packed, it ended up being 1 cup of brown sugar, so this is why there is more brown sugar vs white sugar. You’ll need 1 stick of butter which is 1/2 cup, 4 eggs and 1 tsp of vanilla extract. A pinch of salt is also optional, but I strongly believe that salt enhances the flavors of your baked goods, so use it. You have to separate the egg whites from the egg yolks and using your mixer, beat them until stiff. In the chocolate magic cake version I say to use 1 tsp of vinegar for the eggs whites. 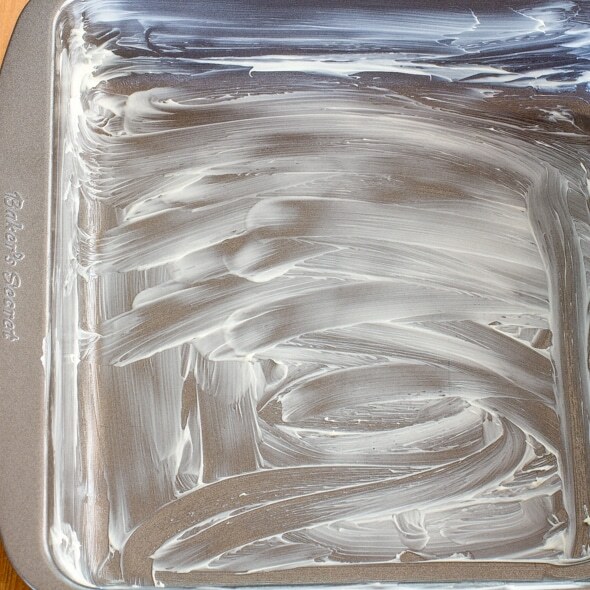 This is only necessary to get stiff egg whites, but if you can get them stiff without the vinegar then don’t add it. However, if you do add it, it will not alter the taste of the cake. 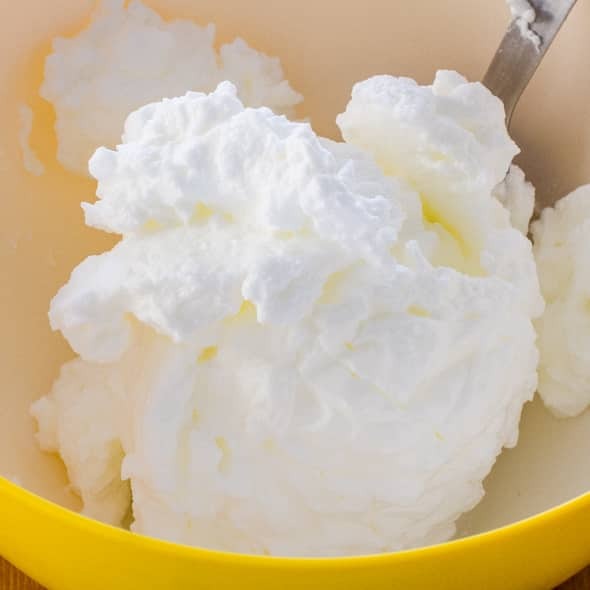 This is what your egg whites should look like. 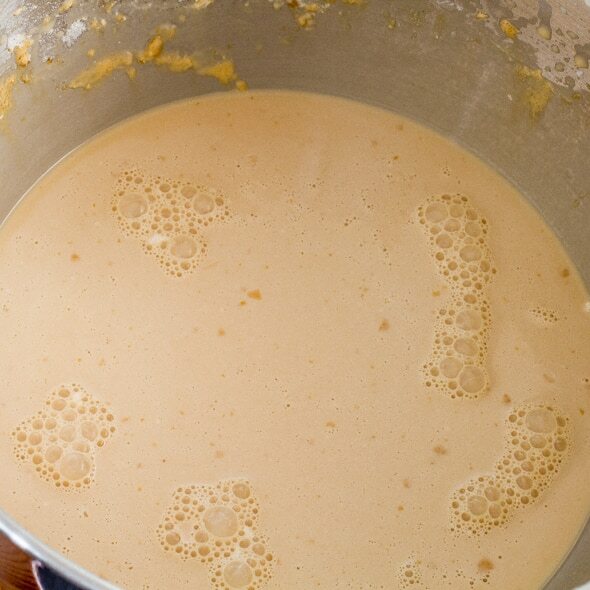 To brown the butter, melt it in a small sauce pan over medium heat. Continue whisking it over medium heat until the butter starts browning and you’ll notice that small little brown specks start to form at the bottom of the sauce pan. It is now done. 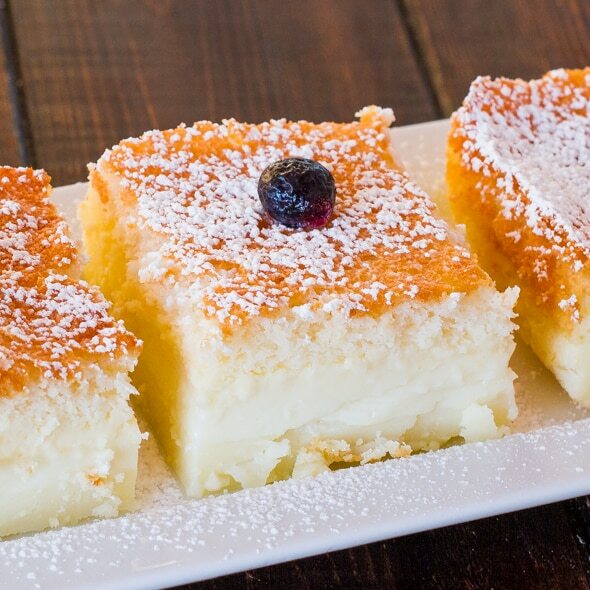 You do not have to do this for the regular magic cake version, melted butter will suffice. You will have to now strain the butter through a fine sieve to get rid of some of those brown specks, though as you can see in mine, there were still some left, but that’s OK. You now need to let the butter cool until it’s at room temperature. 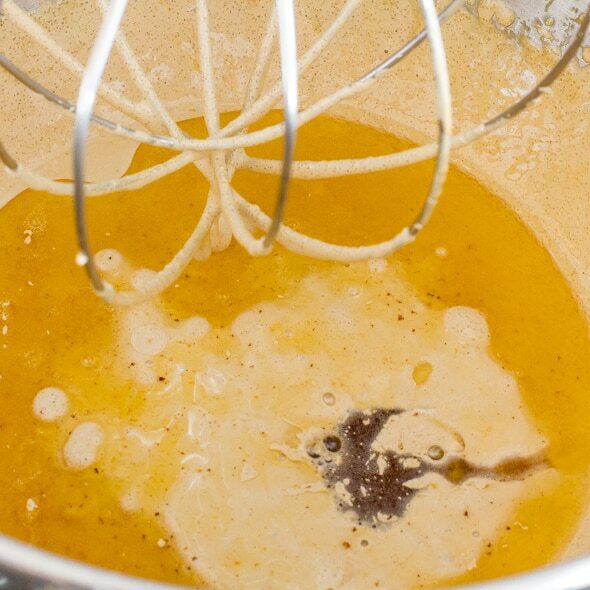 While the butter is cooling, whisk the egg yolks with the brown sugar together. 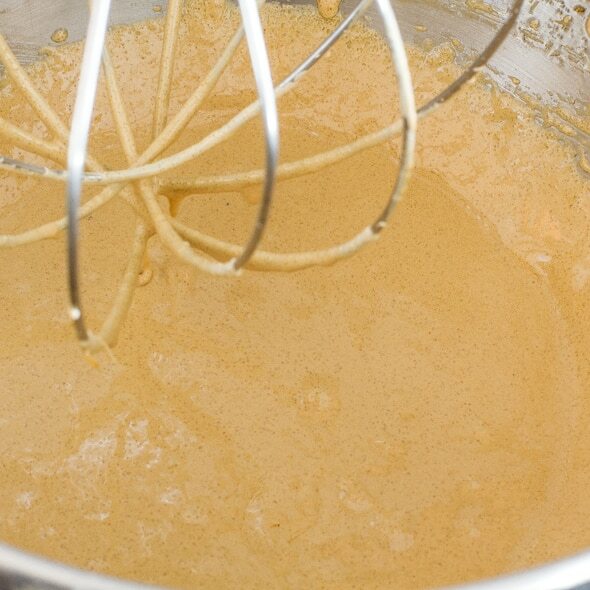 You want to whisk it for a few minutes until it’s a nice light golden color as in the picture below. 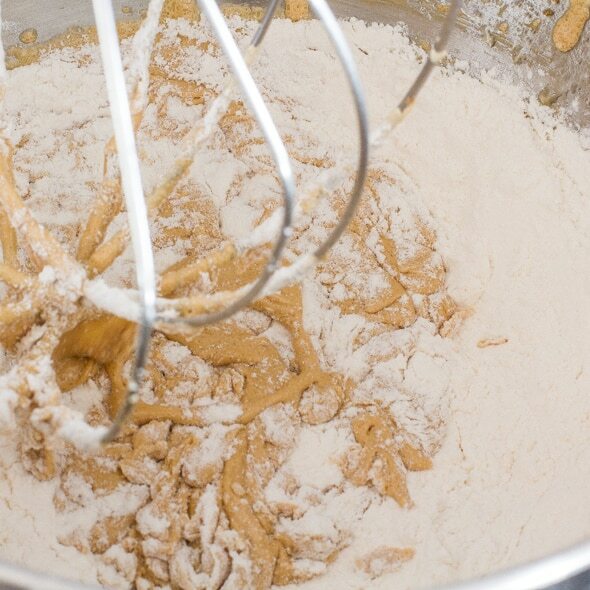 Once the butter has cooled, add it to the mixer together with the vanilla extract. I have used both white and dark vanilla extract, either one will work. 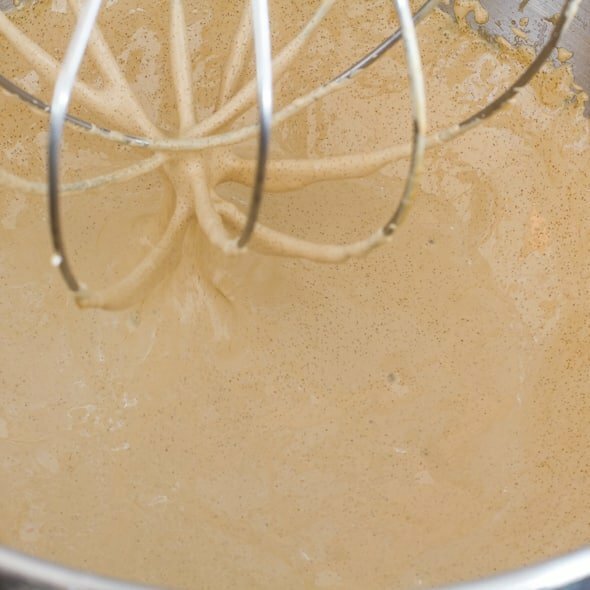 Whisk the butter and vanilla extract with the egg and sugar mixture for another couple minutes, until it’s fully incorporated. Add the flour in. I added all the flour at once. You want to whisk it for 30 seconds to a minute just until everything is fully incorporated. You might need to scrape down the sides of the bowl. You can now add the milk. I used 3% milk this time, I have used 2% milk and it turned out the same. I have not used skim milk, so I’m not sure if there will be a difference. People have asked me how did I warm the milk to get it lukewarm, did I use a microwave or on the stove top. It doesn’t matter. Use whatever is easier for you. I used the microwave and I microwaved for about a minute just until it was lukewarm when touched. I added the milk a little bit a time and whisked on low speed, scraping the sides and the bottom of the bowl as needed. 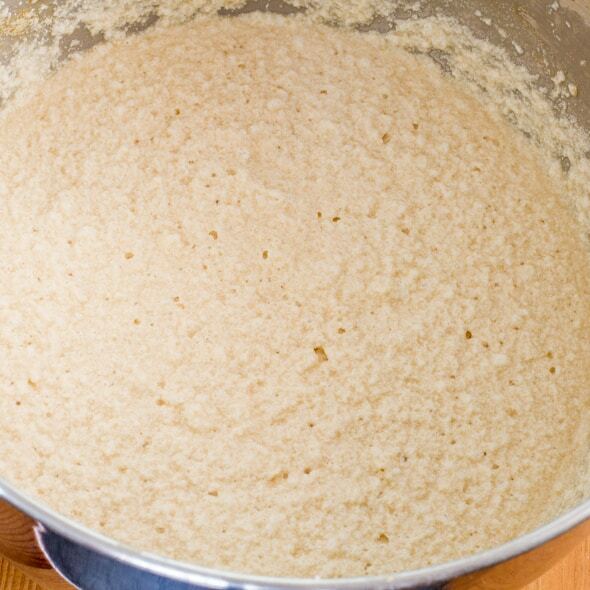 Look how watery the mixture is, this is how it should be, don’t be looking for a regular cake consistency. Now you can add the egg whites. I don’t think there’s any secret here. You can add 1/3 at a time, but I simply added them all at once and I used the whisk from my mixer to slowly whisk the egg whites in. You can use a spatula and slowly fold in the egg whites, but I have a feeling you’ll be there forever. It’s up to you. I want you to notice the little bits of egg whites, kind of like a foam that are floating at the top of the batter. This is OK, yours will probably look the same. This will be part of the top cake layer. 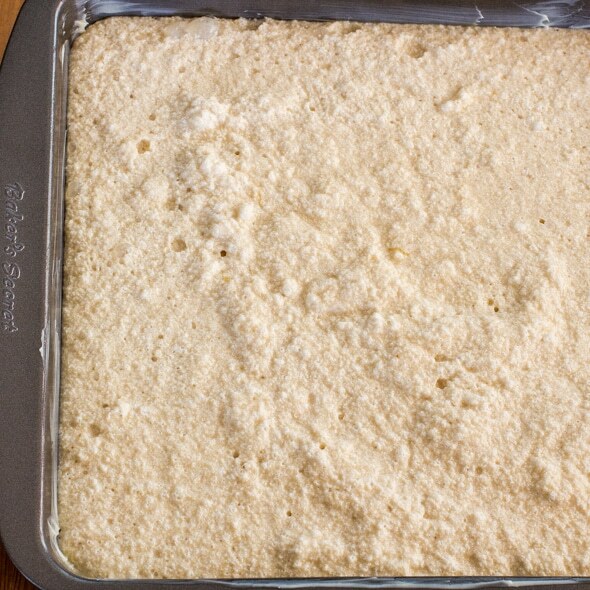 I used an 8×8 inch baking pan. I’ve used a glass dish before, now I’m using a tin pan. It doesn’t matter. This time I’m buttering the pan, last time I didn’t. Again it doesn’t matter, there is no secret to this cake and there are no certain specific steps you need to follow. If you feel better buttering the pan then do so, it’ll probably be easier to remove the slices out. Pour the batter into the prepared pan and you’ll notice that the egg whites are still floating at the top. The baking part. The one thing I can tell you for sure is the temperature which should be 325 F degrees, or 160 C degrees. The baking time can vary drastically because each oven is different. I can only tell you how long I baked it for. This time I baked my cake for 50 minutes, but I have a new oven. Last year when I made the other two versions of the cake, I baked them for 60 minutes, but I had an older oven. So how do you know when your magic cake is done baking? I checked mine after 40 minutes, I touched the top with my finger and it was very puffy, and a bit jiggly. Although it was browned on top just like in the picture below, because it was still a bit jiggly I put it back in the oven for another 10 minutes. And after 50 minutes it looked like in the picture below. The top was still a bit puffy but that’s OK because this is the cake layer. You will also notice the cake will fall a bit in the middle, it will puff up as you bake it, and after you take it out of the oven it might collapse a bit, this is also OK. I let the cake cool completely, but because I am impatient, I put it outside on the deck to cool, although it’s not so cold today it’s still cold enough to cool my cake in a few minutes. 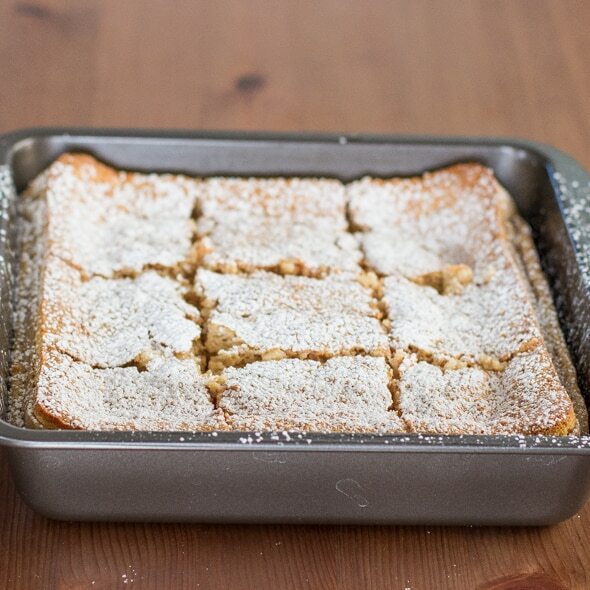 I cut it into slices while it was still in the pan and sprinkled with some powdered sugar. And that’s all there is to it. It is really easy to make. A lot of people have asked can I use this or that, can I substitute this or that. My answer to all those questions is I have no idea what will happen when you substitute other ingredients like margarine for butter, or gluten free flour. I can only say it’s up to you if you want to experiment, however keep in mind the cake might not turn out as expected. So there you have it my friends, the butterscotch flavor of this magic cake. Check out the video for the original magic cake and see how easy it is to make this cake! 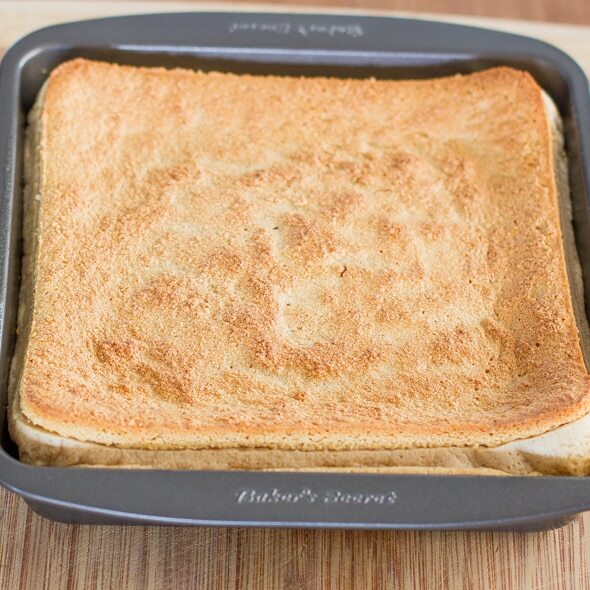 Butterscotch Magic Cake - one very thin simple batter amazingly turns into a 3 layer cake as it bakes. It's magical! Start by heating the butter in a small saucepan over medium heat until melted. Whisk continuously until it becomes golden brown and tiny dark brown flecks appear in the bottom of the pan. Remove from heat, whisk for another 30 seconds and strain through a fine sieve into a bowl. Let cool to room temperature. 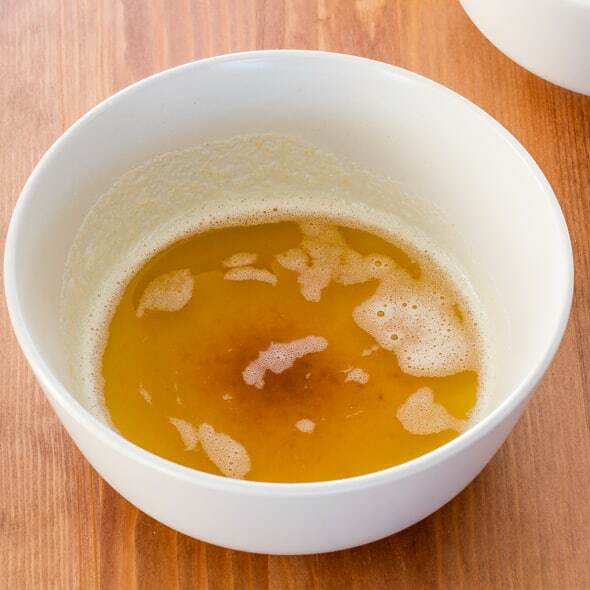 Beat the egg yolks with the brown sugar until light golden color. 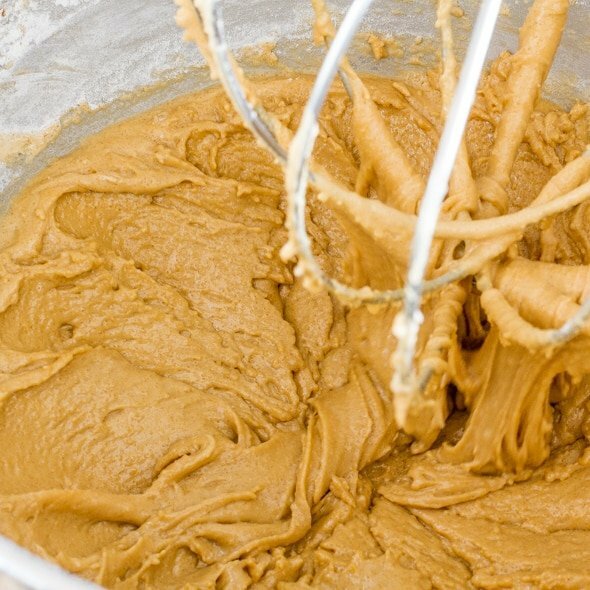 Add butter and vanilla extract and continue beating for another minute or two after which you can add the flour and mix it in until fully incorporated. Slowly start adding the milk and beat until everything is well mixed together. The mixture will be very watery. Add the egg whites, a third at a time and gently fold them in using a spatula, repeat until all egg whites are folded in. 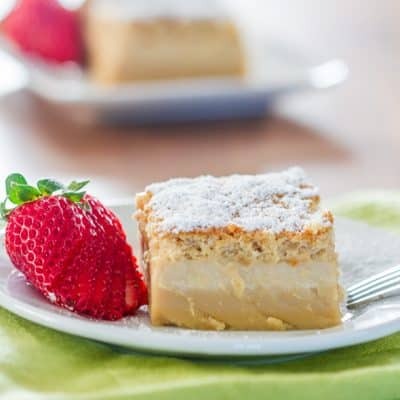 Another variation to folding in the egg whites would be to add a third of the egg whites and gently whisk them in to the cake batter, then reverse the process and add a bit of the cake mixture to the egg whites and gently whisk in, repeat until all cake batter has been whisked in. To get the milk lukewarm I usually warm it in the microwave for about a minute. The baking time can vary greatly for this cake. I've baked this cake in 3 different ovens and I've always needed different times which were from 40 to 70 minutes. The oven I have right now only requires about 45 minutes to get a nice golden color on the cake, whereas other ovens I've used required the full 70 minutes. Test if after 40 minutes to see what it looks like. The cake is done when it only jiggles slightly but feels firm to touch. 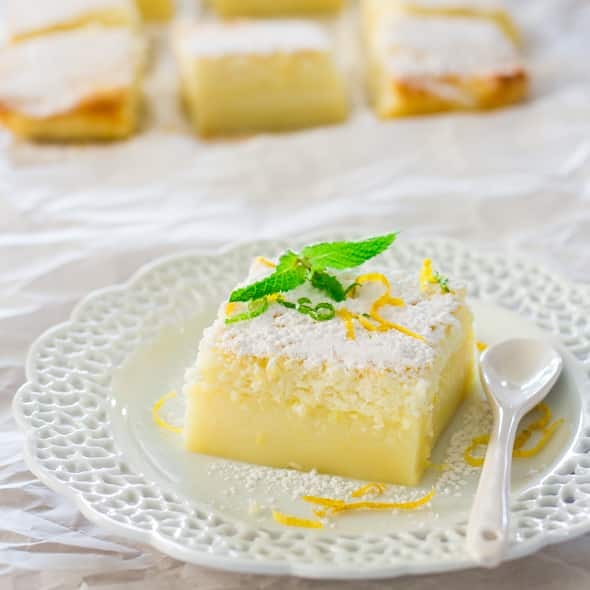 Click the image below for the original Magic Cake recipe. 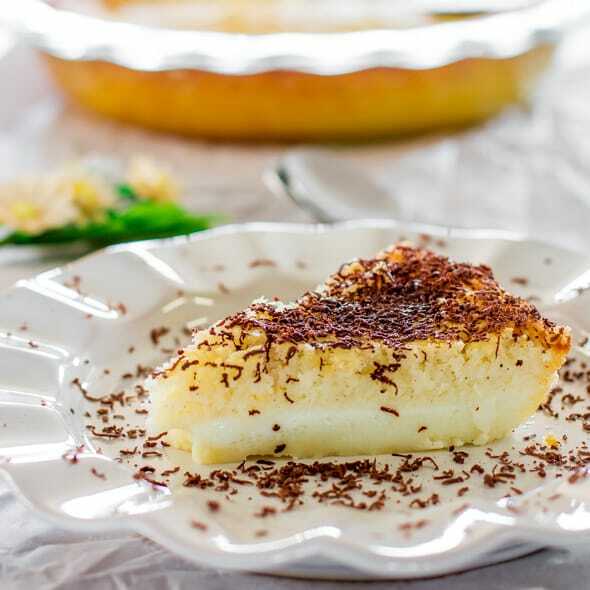 For an easy version of a impossible coconut pie, same ingredients, different preparation technique click here or the image below. 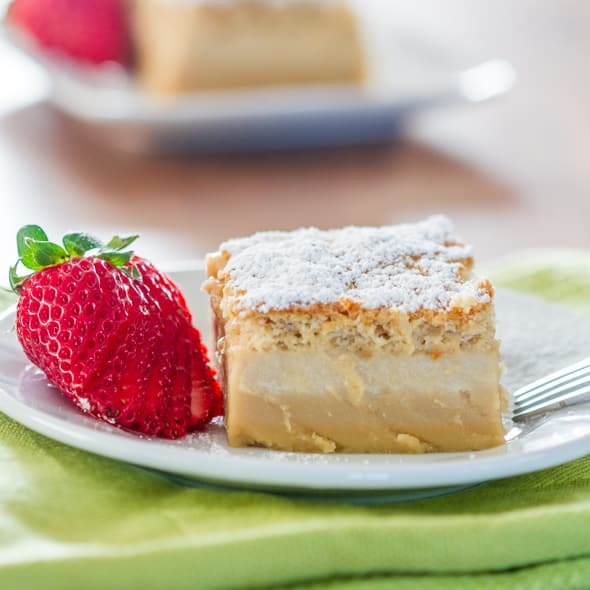 Here’s the latest addition to magic cakes, the irresistible magic flan cake! Do you think these could be made into cupcakes? I think so, but the baking time will have to be reduced.